Quantification of methane, ethane, propane, butane, and pentane concentrations in gas, liquid, or sediment samples. 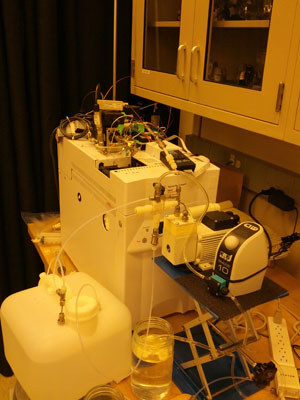 We are currently developing a preconcentration device and autoanalyzer for this system. Picarro G2201-i that measures [CH4], [CO2], water vapor, δ13C-CH4, δ13C-CO2 and δ13C-DIC. 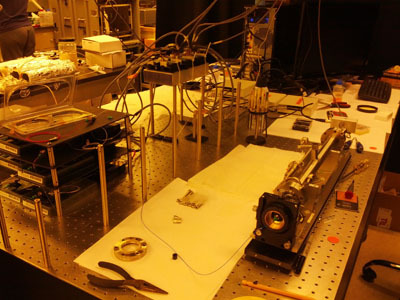 We are continually developing our own Cavity-Ringdown Spectrometers for the most efficient analyses of methane and carbon dioxide isotopes in the field with minimal sample preparation. Chen, Y., K. Lehmann, J.D. Kessler, B. Sherwood Lollar, G. Lacrampe-Couloume, T.C. Onstott, (2013) “Measurement of the 13C/12C of atmospheric CH4 using near-IR Cavity Ring-down Spectroscopy.” Analytical Chemistry, doi: dx.doi.org/10.1021/ac401605s. We have developed techniques for the analysis of the natural radiocarbon content of methane in free gas as well as dissolved in water or sediment at both high and extremely low concentrations. The techniques involve the extraction of methane from the aqueous or sediment medium in the field followed by laboratory vacuum line techniques for the preparation of the sample for Accelerator Mass Spectrometry (AMS) analysis. The techniques concurrently prepare the samples for stable isotope analyses of δ13C and δ2H via Isotope Ratio Mass Spectrometry (IRMS). 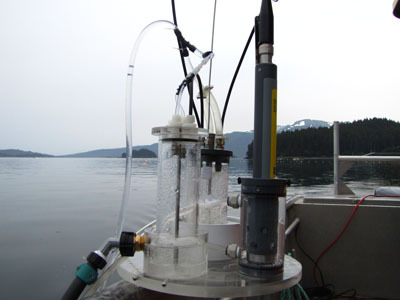 Kessler, J. D., and W. S. Reeburgh (2005), Preparation of natural methane samples for stable isotope and radiocarbon analysis, Limnology and Oceanography: Methods, 3, 408-418. Currie, L.A., J.D. Kessler, J.V. Marolf, A.P. McNichol, D.R. Stuart, J.C. Donoghue, D.J. Donahue, G.S. Burr, D. Biddulph (2000). “Low-level (submicromole) Environmental 14C Metrology.” Nuclear Instruments and Methods B, 172, 440-448. 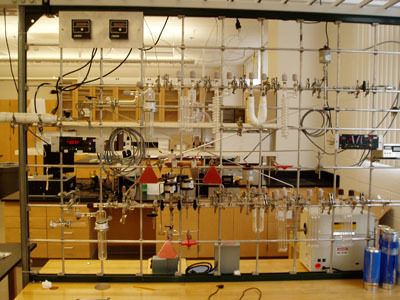 Our lab has numerous equilibrators and gas extraction devices that have been appropriately connected to our Cavity-Ringdown Spectrometers for the continuous analysis of pCH4 and pCO2 in surface waters. Copyright © . Theme by Wiggleware.